The West Coast Rainy Season can wreak havoc and result in dangerous flooding conditions, such as flash floods, mudflows, and breached levees. Flood risk also increases if an area has been affected by wildfires, a common occurrence on the West Coast. Here is some basic information before you begin writing a flood insurance policy. Floods are the number one natural disaster in the United States. People need to know they can take steps to reduce the financial impact of flooding before disaster strikes. One important step is to understand your risk. Many factors—both natural and man made—can impact flood risks. Dams are an important resource in the United States; however, there are unique risks associated with dams and they can also be breached with little warning. Floods are the number one natural disaster in the United States. People need to know they can take steps to reduce the financial impact of flooding before disaster strikes. One important step is to understand the risks associated with living near a levee. There are currently thousands of miles of levees across the country providing some level of protection for millions of people. However, no levee provides full protection from flooding—even the best flood-control structure cannot completely eliminate the risk of flooding. Floods are the number one natural disaster in the United States. People need to know they can take steps to reduce the financial impact of flooding before disaster strikes. One important step is to understand your risk. Many people do not realize that new development can change their flood risk by affecting how an area is able to handle potential flood conditions. 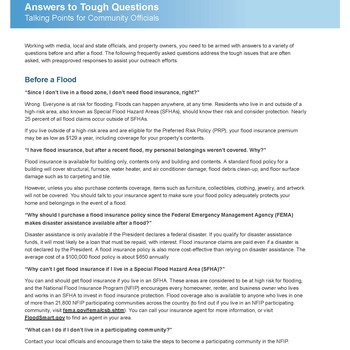 These talking points can be used by community officials to help explain Flood Insurance Rate Maps (FIRMs). Floods are the number one natural disaster in the United States. People need to know they can take steps to reduce the financial impact of flooding before disaster strikes. One important step is to understand your risk. Even a heavy rain storm can cause significant flooding, contributing to flash floods or mudflows or overtopping levees and dams. The National Flood Insurance Program provides a streamlined process to allow property owners to retain their coverage by converting their existing standard-rated policy (residential or non-residential) to a less-expensive Preferred Risk Policy (PRP) without a change in the policy’s effective date or a gap in coverage. Start marketing now. Talk to your existing residential and commercial clients about the PRP as soon as possible. Not only will you help to minimize their financial burden, but you also will build your business. These talking points can be used by community officials to discuss Increased Cost of Compliance (ICC) as an additional option to help fund rebuilding. Be Prepared Before the Next Flood. In addition to insuring your property, there are things you can do to minimize potential losses to your home and ensure your family’s safety. FloodSmart—the marketing campaign for the National Flood Insurance Program (NFIP) — provides tools, resources, marketing and sales tips, and referrals to help you grow and keep that business. Floods are the number one natural disaster in the United States. People need to know they can take steps to reduce the financial impact of flooding before disaster strikes. One important step is to understand your risk. Wildfires dramatically change landscape and ground conditions, which can lead to increased risk of flooding due to heavy rains, flash flooding and mudflows. The National Flood Insurance Program’s (NFIP) FloodSmart program was developed to alert customers to their flood risk and encourage them to contact their agent to purchase flood insurance. If they do not have an agent, they can visit the FloodSmart.gov website or call a toll-free number to be connected with an agent in the Agent Referral Program. This page contains tools and resources communities can use to plan for their High Water Mark Events. A variety of audiences such as local officials, emergency management personnel, community leaders as well as FEMA Regions, Federal, state, and local entities can learn more about the HWM Initiative in the sections below. Flood hazard maps, also known as Flood Insurance Rate Maps (FIRMs), are used to identify a property’s flood risk. When considering the purchase or renewal of a flood insurance policy, property owners should first understand their risk. Use these tips and talking points to educate your clients and prospects on the impact of flood map changes and what flood insurance options are available. The National Oceanic and Atmospheric Administration (NOAA) forecasts that a strong El Niño will bring heavy rainfall this winter, especially to the southern tier of the United States. The intensity of rainfall in the coming months could lead to devastating floods, especially in areas affected by prolonged drought or areas scarred by past wildfires. This fact sheet provides information you need to know about increased flood risks due to El Nińo. El Servicio Nacional de Meteorología pronostica que El Niño traerá lluvias fuertes en el invierno este año, especialmente en la parte sur de los Estados Unidos. La intensidad de las lluvias en los próximos meses podría conllevar inundaciones devastadoras, especialmente en las áreas afectadas por sequías prolongadas o áreas amenazadas por incendios forestales previos.